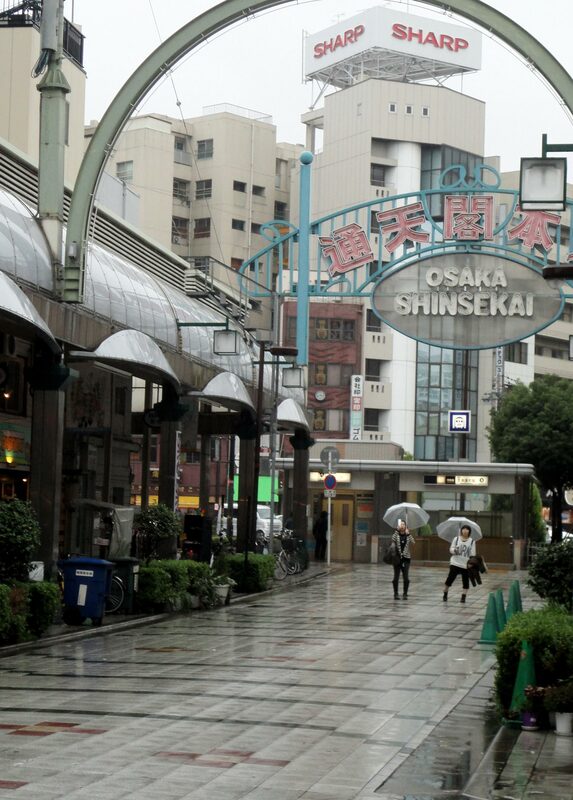 Shinsekai (新世界), meaning “new world”, is a neighborhood with an interesting history. 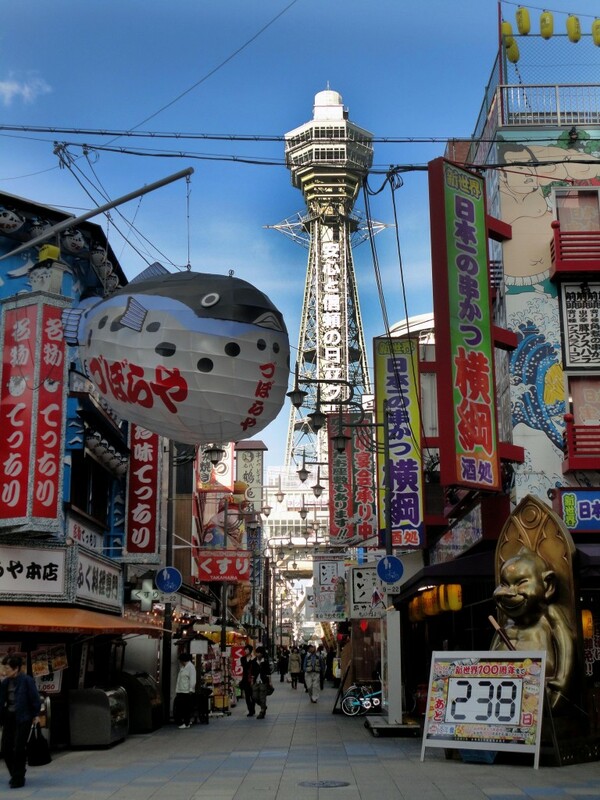 Located in the southern part of Osaka, Shinsekai was originally modeled after Paris, complete with a large, Eiffel Tower-like structure. It used to be home to Luna Park, an amusement park, although that shut down in the late 1920s. Since the shutdown of Luna Park, Shinsekai became a desolate and rather poor area. For a point in time, it was actually considered a somewhat “dangerous” area because a large population of homeless people had moved in. Today, the area is again booming with business and a unique place for tourists to visit. 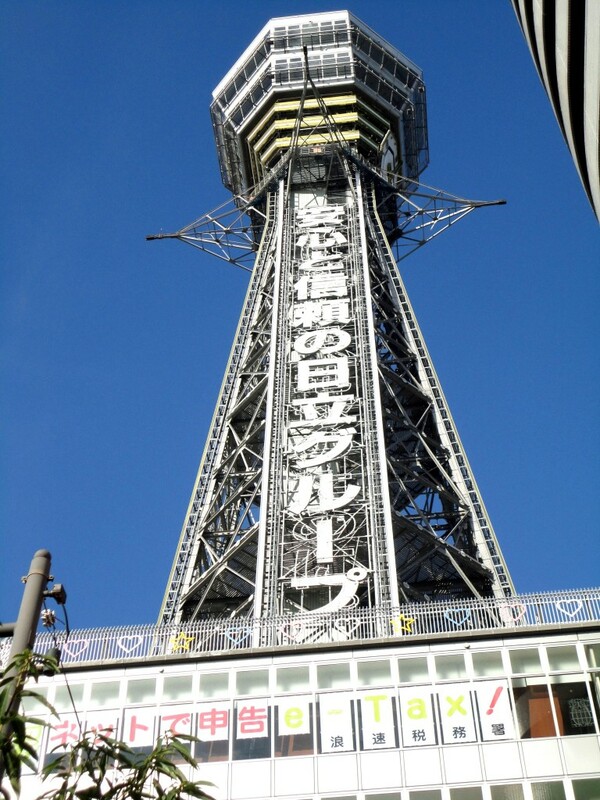 The highlight of Shinsekai is the Tsutenkaku Tower, which is located in the center of the neighborhood. This tower had replaced the previous Eiffel Tower-looking structure after World War II ended. It is 103 meters tall, and offers some of the best views of Osaka around. On a bright, clear day the views looking over Osaka are unobstructed and picture perfect. The panoramic view is a reason alone to venture out into Shinsekai. Around the base of the tower, you’ll find plenty of shops and restaurants. It was a little touristy, but reminded me of a less crowded Dotonbori. There were even a Zubora-ya, a restaurant known for their famous “fugu”, or blowfish dish. Most of the shops seemed to be souvenir shops, which is another reason why Shinsekai is fun for tourists. Mixed in amongst the shops, you’ll find plenty of pachinko parlors also. It is a very picturesque neighborhood with all of the colorful signs and the tower looming in the background. Shinsekai also sits next to Tennoji Zoo and Park, which is another great location to visit if you have the time. Originally from Chicago, Beth got her first true taste of travel when she studied abroad in Japan during her final year of university. She ended up loving Asia so much, she found herself moving right back upon graduating and is currently teaching English full-time in Hong Kong. Armed with her camera and a passion for travel, she is currently on a mission to photograph the world-- proving that you can work the normal “9-5” and still find time to travel on her blog Besudesu Abroad. Temple-ception in Tofukuji, Kyoto. Beautiful and Iconic of Old World Japan.